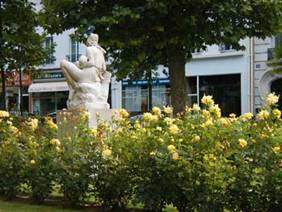 Statue with pigeon and yellow roses in the Place Adolphe Chérioux. This little park is in one of our favorite neighborhoods in the 15th arrondissement. The town hall for the 15th is nearby. This building, facing the park mentioned above, is the kind of place where Tom and I wouldn’t mind owning an apartment. We’d prefer the one with the bigger balconies, near the top. 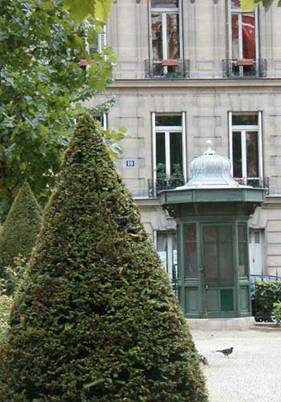 Carefully shaped shrubs in the Place Adolphe Chérioux lead to the little kiosque that houses the park’s guardian. Here is a professional photographer’s view of the park. I notice that several schools are named after Adolphe, who was a member of the town council for the 15th. He lived from 1847 to 1934. Many of the buildings on this park were built in the 1930s. I’ve been walking around this neighborhood for years now, and I’m getting to know some familiar faces and personalities, even though I don’t know their names. There are beggars here and there, of course, and I see a few more of them on market days (Wednesday and Sunday mornings in our neighborhood). Two of these habitual mendicants seem to be of the neighborhood, and they’ve been here for years. I notice older people giving them coins. They are treated with courtesy and respect. I give them money, too, now that I “know” they are okay. One is a woman, probably only in her 40s, but her long hair has gone white. She is trim, and always dressed stylishly if somewhat shabbily. She does not appear to be a drunk. Every once in a while, I see her looking mildly disturbed, muttering to herself. But usually she looks okay, or even almost normal. She has a strange quality that I have seen only in schizophrenics. I lived near a group home for schizophrenics in Columbus for years, so I know this look, even if I cannot exactly describe it. I think this woman lives on a disability check and she occasionally goes off her medication. Lately, I haven’t seen her muttering to herself at all, so I suppose she is taking the meds regularly now. She never sits and begs in one place. She walks the streets, particularly the rue du Commerce with all its stylish shops. She approaches people, and in a timid, tiny voice, she very politely asks, “Madame, please, perhaps you have some small coins for me?” She is always very grateful, even if you only have 50 cents or so to give. She continues to thank you in her tiny voice even after you go on your way. I think she only approaches people whose faces she recognizes from the neighborhood, and now I am one of those. Once I saw a large, older woman from the neighborhood chatting with him. She had asked him if she could get him something from the McDonalds across the street. He asked for coffee. She asked if he would like to have milk in his coffee. I cannot remember his answer. It was a very pleasant, friendly exchange. Meanwhile, over in the zany 5th arrondissement, some jokester has been covering all the plaques with the names of the streets with stick-on plaques that have those same street names in Latin. It is the Latin Quarter, after all. Nobody seems to know who is doing this. There are many theories. Some say it must be students from the Sorbonne. Others say it is probably parishioners from a local church where mass is still said in Latin. A few mistakenly thought the town hall for the 5th was responsible, or perhaps the Paris municipal government. In fact, the 5th and the Paris governments are upset about this because the glue used by the jokesters is excellent. Removing these Latin signs is proving to be tedious and time consuming, therefore expensive. Tourists are lost and very confused, unless they know Latin. So, if you come to Paris, bring your Latin-English dictionary as well as your French-English dictionary. You wouldn’t want to skip the Latin Quarter.